Fall Carnival Booth Idea - Needle in a Haystack! Packaged Toys are Best to Hide in the Hay! A Fun & Easy Set Up booth for Fall Festival. Before your festival, mark out the space where you will spread the hay. This activity can be set up on the ground or on tables so see setup based on how you will run this activity below. You may wish to have your space be about 10 ft x 10 ft. If you have a square tent cover - you can use the pennant banner to quickly rope off 3 sides of the booth so you can restrict the number of children playing at one time. If you are on the grass, you may also use balloon sticks with balloons to mark off your booth area. 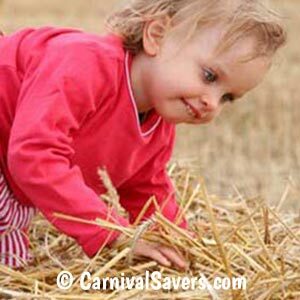 Add a mix of some of your prizes to the hay and under to hay to make children really search for their goodies! For smaller events, use two large tables pushed together. If using tables remember some of your players will be young children, so it is best to choose table with adjustable legs height, and place the tables on the lowest setting so all children can reach the hay. 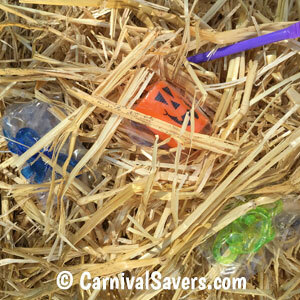 Add a variety to some of the prizes under the hay so children will need to search to find some goodies. Players pay an amount, say 2 tickets, to come into this carnival booth and search through the hay for their favorite 1-3 prizes (decide before the event if they choose one, two or three prizes)! 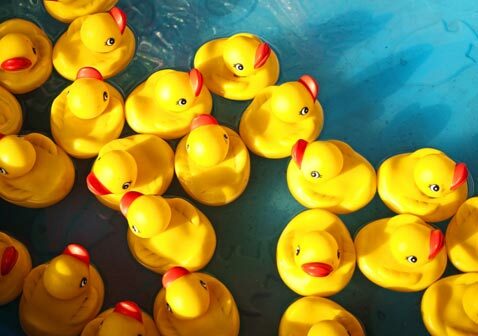 Be sure to limit the number of players searching at one time so it is not too crowded. Also, make sure the children are not climbing up a mountain of hay – have the hay spread out fairly well – maybe a small hill a few feet high would be fine in the middle if this is on the ground. 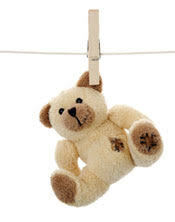 Once children find their predesigned prizes, they are done and they can take their goodies and be off to to next booth. Fun carnival prizes for this booth could be bubble gum coins, non-breakable rings, sticky hands, packaged candies, and even a dozen or so real half dollars would be great fun for kids! Be sure to choose prizes that would not break if stepped on (if played on the ground) and having a large variety of prizes is a great idea for this booth! Tip: Do not put out all of the prizes at once! 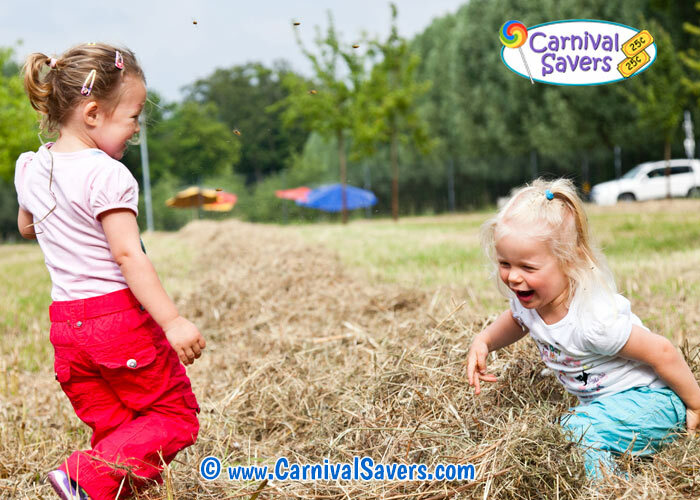 Put out prizes throughout the carnival so that children playing later in the day still have a chance to find that popular carnival prize hidden in the hay! SOME GREAT TREASURES to be found in the HAYSTACK FIND BOOTH!